Ever since the economic recession began in 2008, restaurant owners have had a hard time staying in business. These days, in order to succeed in this increasingly competitive industry, restaurant owners need to use every possible advantage they have access to. And one big advantage that is often overlooked is having a strong web presence for your business. Thankfully, WordPress and developers like Restaurant Engine are making it easier and more affordable to create high quality restaurant websites. 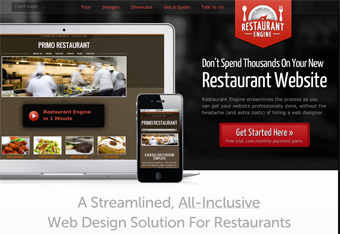 Restaurant Engine is a WordPress restaurant theme developer. Unlike most WordPress theme developers, Restaurant Engine (or RestaurantEngine) ONLY makes themes for restaurants, cafes, etc. Because of this, they have the most experience in the industry, making them the go-to choice for many entrepreneurs looking to increase their restaurant income advertising exposure. Restaurant Engine is truly a unique WordPress restaurant theme developer. They are committed to their customers, and ultimately want to make the website building process as easy and painless as possible. The themes they build are all easy to install, and they keep the customization options to a minimum in order to keep things simple. Plus, every design they make is stunningly beautiful, yet elegantly simple – perfect for restaurant websites. And it’s not just the designs that make these themes stick out, it’s the features. For one, Restaurant Engine themes are responsive, which means that they work great on mobile devices. This is an important feature, considering that many people browse restaurant websites from their phones while on-the-go, especially when in areas they are unfamiliar with. If your restaurant doesn’t have a website, you are missing out on hundreds of potential clients.